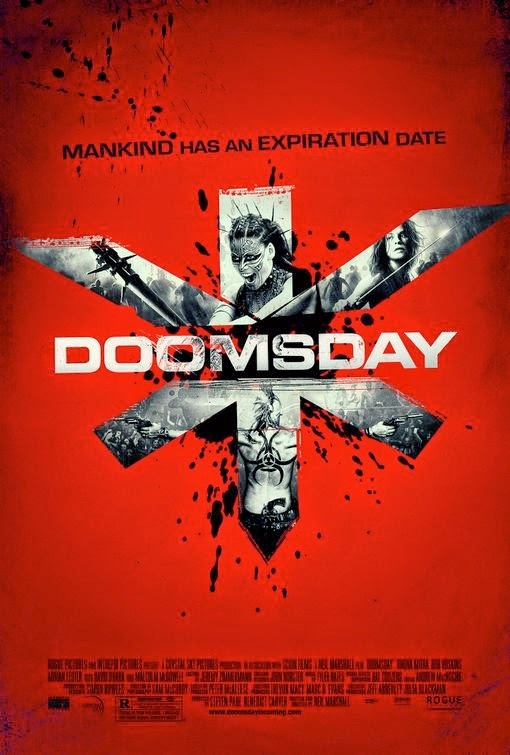 Tag line: "Mankind has an expiration date"
Drawing influence from such movies as Mad Max and Escape from New York, director Neil Marshall’s 2008 film Doomsday is an action extravaganza. A deadly new virus, nicknamed the “Reaper”, is spreading like wildfire through Scotland, leaving tens of thousands dead in its wake. Hoping to contain the virus, England constructs a huge wall that essentially cuts the island in half, ensuring nobody, whether infected or not, will ever leave Scotland again. Flash forward 27 years; everyone north of the wall is believed dead, while those in the south suffer from overcrowding and a higher-than-normal unemployment rate. To make matters worse, a police raid in the Whitechapel District of London turns up evidence that the Reaper virus is back! It’s at this point the Prime Minister of England (Alexander Siddig) and his second-in-command, Canaris (David O’Hara), share some startling information with security chief Bill Nelson (Bob Hoskins): For the past 3 years, satellite photos taken in the north have revealed that not everyone on the other side of the wall is dead. Hoping to give their political careers a much-needed boost, the Prime Minister and Canaris ask Nelson to send his best operative into Scotland to look for a doctor named Kane (Malcolm McDowell), who they believe has developed a cure for the virus. For this difficult mission, Nelson selects Maj. Eden Sinclair (Rhona Mitra), who, as a young girl, was saved when her mother, a Scot, arranged for her safe passage to England. With only 48 hours to find Kane, Maj. Sinclair leads a squad of mercenaries into the north, but as she and her team will soon discover, those who’ve managed to survive aren’t going to welcome them with open arms. Doomsday is a balls-to-the-wall action movie that gets crazier (and more intense) with each passing scene. Initially unsure of how many survivors there are, or that they'd even be able to find one, Sinclair and her team, while searching the hospital where Kane was headquartered, are taken by surprise and captured by the followers of a madman named Sol (Caig Conway), who gets a kick out of torturing people (Sol burns a member of Sinclair’s squad to death, then has him carved up and served for dinner). With the help of fellow prisoner Cally (MyAnna Buring), who happens to be Sol’s sister, Sinclair and a few others manage to escape. Eventually, they do find Dr. Kane, only to discover he’s every bit as crazy as Sol (he and his minions reside in an ancient castle, living as if it were still the Middle Ages. In one exciting scene, Knox, who's set himself up as a king, forces Sinclair to do battle with a knight in shining armor). There’s even a car chase towards the end of the film that looks like it was lifted straight out of The Road Warrior! At times, Doomsday is so over-the-top that it feels more like a parody than an homage, but don’t let that fool you: this picture is deadly serious, and, with its plethora of high-octane scenes, is a film that’s sure to satisfy most genre fans. You've done it again Doc! Another movie that somehow managed to totally pass me by. In truth I tend to be less disposed to give action and sci-fi movies from the UK a chance as I find foreign offerings in those genres provide more of the sense of escapism that I crave, but this one does sound pretty promising. I like my dystopian futures to be somewhat over-the-top. Not to mention the fact that it has Alexander Siddig in it (from my favourite Star Trek series)!